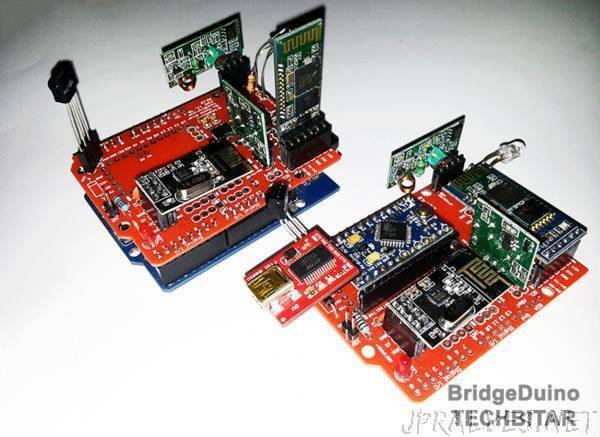 “BridgeDuino (R 0.11) is a Swiss army knife PCB for rapid networking of inexpensive wireless communication modules. Breadboards are super for one-off experiments. But after prototyping half a dozen wireless prototypes involving more than just two Arduinos, the wiring mistakes and associated debugging grew more time consuming. BridgeDuino facilitates rapid multi-node prototyping & testing of networks based on popular, cheap wireless modules and the Arduino platform. I did not wish to make a separate PCB for each of the various wireless components, so I figured why not one PCB to rule them all. I also wanted a PCB that can act as a shield to Arduino Uno as well as work with the inexpensive and low-power Arduino ProMini.